A stay at Appart'City Clermont Ferrand Centre places you in the heart of Clermont-Ferrand, within a 15-minute walk of Place de Jaude and Musee Bargoin. This residence is 8.8 mi (14.1 km) from Vulcania and 1 mi (1.5 km) from Blaise Pascal University. When you stay at B&B Hôtel Clermont Ferrand Le Brezet Aéroport in Clermont-Ferrand, you'll be near the airport and 8 minutes by car from Roger Quilliot Art Museum. This hotel is 4.3 mi (6.9 km) from Place de Jaude and 11.9 mi (19.2 km) from Vulcania. Featured amenities include complimentary newspapers in the lobby, luggage storage, and a safe deposit box at the front desk. Self parking (subject to charges) is available onsite. With a stay at Campanile Clermont Ferrand Centre, you'll be centrally located in Clermont-Ferrand, within a 15-minute drive of Place de Jaude and L'Aventure Michelin. This hotel is 10.1 mi (16.2 km) from Vulcania and 0.3 mi (0.4 km) from ASM Experience Rugby Museum. Enjoy a meal at the restaurant or snacks in the apartment's coffee shop/café. Continental breakfasts are available daily from 5 AM to 1:00 PM for a fee. Featured amenities include complimentary wired Internet access, a computer station, and complimentary newspapers in the lobby. Planning an event in Clermont-Ferrand? This hotel features 797 square feet (74 square meters) of event facilities. Free self parking is available onsite. Clermont-Ferrand capital of the Auvergne region, is surrounded with unique volcanic landscapes and has many historic and artistic treasures. The city has much to offer visitors, including a rich gourmet tradition and charming old districts. 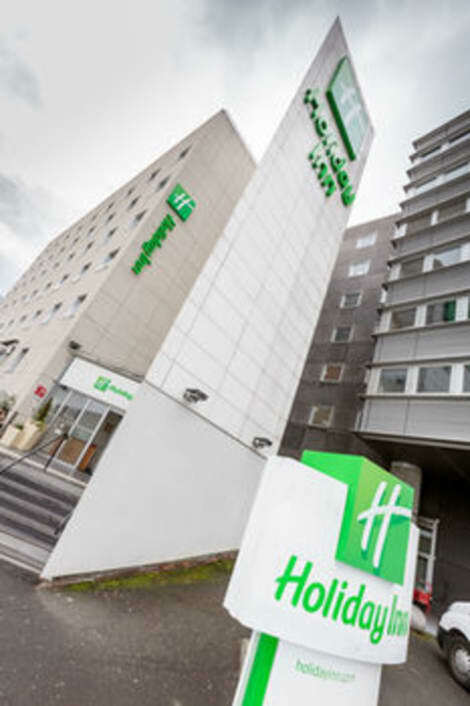 Holiday Inn Clermont-Ferrand is ideally situated in the heart of the city opposite the famous Jardin Lecoq Botanical garden, only a few minutes from the Jaude square and the Exhibition and Congress Centre. From the hotel, on foot or by tramway you can discover the city centre with Notre Dame de l'Assomption Cathedral, the Basilica Notre Dame du Port, the Roger Quillot Art Museum as well as the Montferrand District, the former city center. Holiday Inn Clermont Ferrand has 94 air-conditioned rooms fitted with Wi-Fi Internet access office space, also satellite and Pay TV Our restaurant Le Gergovia, proposes t At this hotel you can enjoy: - Free WiFi throughout the building - A 24-hour Business Centre - Underground parking: free for daytime use, fee payable overnight - A Fitness Centre Comfortable rooms come with tea- and coffee-making facilities and satellite TV, as well as a pillow menu to ensure a restful night. Wake up to a full American breakfast buffet in Le Gergovia restaurant, where you can also enjoy authentic regional cooking at lunch and dinner from Monday to Friday. Kids stay and eat free. After a busy day, you can relax with a cocktail in Les Volcans bar. The city of Clermont-Ferrand is famous for a couple of noSEOSITE_LEVEL_DESCRIPTION things, including being the home of tire giant, Michelin, but most impressively, it is also the location of the Chaîne des Puys, the string of dormant volcanoes encircling the city, giving it a most beautiful and unusual setting. It's also the venue of the world-famous annual Clermont-Ferrand International Short Film Festival, the most respected celebration of short films across the globe, with visitors flocking to the city each year to be a part of it. One of the tourist hotspots in the city has to be the Place de Jaude, and with good reason. This grand square in the centre of Clermont-Ferrand is vibrant and atmospheric, and the impressive statue of Vercingetorix, a Roman leader, created by the same man who sculpted the Statue of Liberty, is a perfect photo opportunity. While you're there, be sure to check out the UNESCO listed, 11th-century Notre-Dame du Port. It's one of the stunning churches in the city well worth seeing. Make sure you also take a stroll through the beautiful and relaxing Lecoq Gardens. There's no shortage of places to stay in this buzzing city. 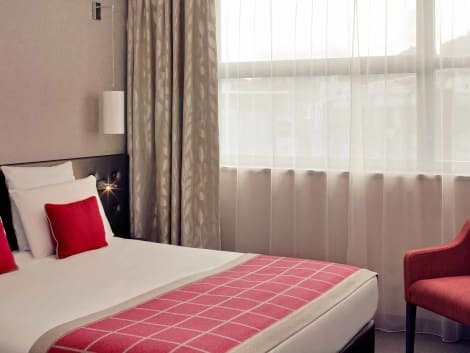 Popular Clermont-Ferrand hotels include the modern and luxurious Mercure Clermont Ferrand Centre Jaude and the Hotel Oceania, while smart budget options include the Ace Hotel Clermont-Ferrand La Pardieu or the Hotel Lune Etoile. To truly experience life in the city, you must visit some of its lively restaurants. Rei Galo serves authentic Portuguese cuisine, the Australian Coffee House is a lovely spot for a drink and a treat, and the Avenue is a great option for typically French food. So to get the most from your trip in Clermont-Ferrand, make sure to explore some of its best sights and lovely restaurants.